You can use the kit to inflate a non-punctured under-inflated tire. 1. Open the trunk floor lid. 2. Remove the kit from the case. 3. Place the kit, face up, on flat ground near the flat tire, away from traffic. Do not place the kit on its side. 4. 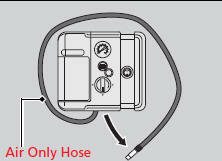 Remove the air only hose from the kit. 5. 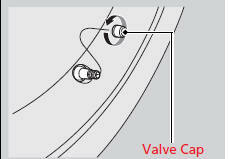 Remove the valve cap. 6. 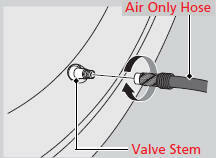 Attach the air only hose onto the tire valve stem. Screw it until it is tight. 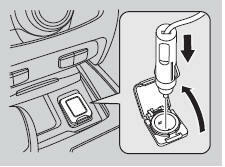 Do not operate the temporary tire repair kit compressor for more than 15 minutes. The compressor can overheat and become permanently damaged. 7. Plug in the kit to the accessory power socket. - Be careful not to pinch the cord in a door or window. 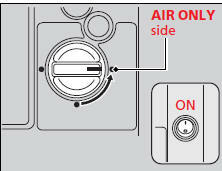 - Do not plug any other electronic devices into other accessory power sockets. - Keep the engine running while injecting air. 9. Turn the selector switch to AIR ONLY. 10. Press the inflator switch to turn on the kit. - The compressor starts to inject air into the tire. 11. Inflate the tire to the specified air pressure. Running the engine with the vehicle in an enclosed or even partly enclosed area can cause a rapid build-up of toxic carbon monoxide. Breathing this colorless, odorless gas can cause unconsciousness and even death. Only run the engine to power the air compressor with the vehicle outdoors. 12. Turn off the kit. - Check the pressure gauge on the air compressor. - If overinflated, press the pressure relief button. 13. Unplug the kit from the accessory power socket. 14. Unscrew the air only hose from the tire valve stem. Reinstall the valve cap. 15. 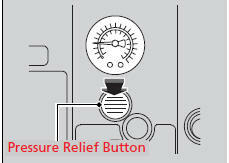 Press the pressure relief button until the gauge returns to 0 psi (0 kPa). 16. Repackage and properly stow the kit.